Over a period of about a million years, an enormous quantity of lava from deep in the Earth's interior oozed up through giant cracks in Siberia's crust. The molten mass "froze" into step-like slabs of flood basalts, volcanic rocks known as the Siberian Traps. The lava from the Siberian Traps sent huge quantities of carbon dioxide and methane (natural gas) into the atmosphere. These greenhouse gases caused an epic spell of global warming. Toxic acid rain drizzled from the sky, and the ozone shield in the atmosphere thinned, letting deadly ultra-violet radiation pass through. As is happening now, the Earth warmed more near the poles than it did at the Equator. The smaller temperature difference slowed the great ocean currents that keep the waters circulating. The oceans stagnated and lost most of their oxygen. Marine plants and animals suffocated. What happened to snuff out life on land is still debated. Some researchers believe that bacteria in the ocean, living on sulfur instead of oxygen, churned out vast quantities of hydrogen sulfide (H2S), a lethal gas with a rotten-egg smell. As the hydrogen sulfide gas emerged from the sea, it choked half of all land creatures. Atmospheric concentrations of CO2 reached 1,000 to 1,500 parts per million. Today's level is 385 parts per million and the concentration is currently rising at 2 parts per. Boyd is interest in laying out this particular scenario and not in going into alternative ideas. He certainly doesn't assert that there is a scientific consensus behind this. This Wikipedia article lays out some ideas: Permian-Triassic extinction event. You don't know the differences between Bingman-Spector, Sanders-Boxer, Udall-Petri, Kerry-Snowe, or Lieberman-Warner global warming bills? Resources for the Future has what you need: Key Congressional Climate Change Legislation Compared in Latest RFF Document. The main resource here is a nice one-page table listing the 12 climate change bills in play as of January 11, and comparing them on six key characteristics. Here's how they stack up in terms of their CO2 emission goals (click to make the image larger). 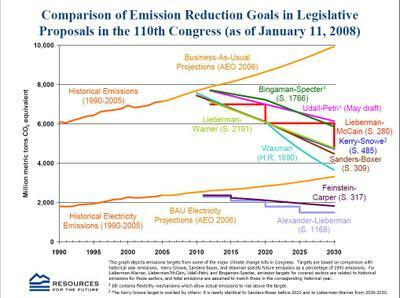 The Feinstein-Carper and Alexander-Lieberman bills aren't comparable to the others, they focus on capping electricity sector emissions. The other bills involve economy wide caps or taxes.